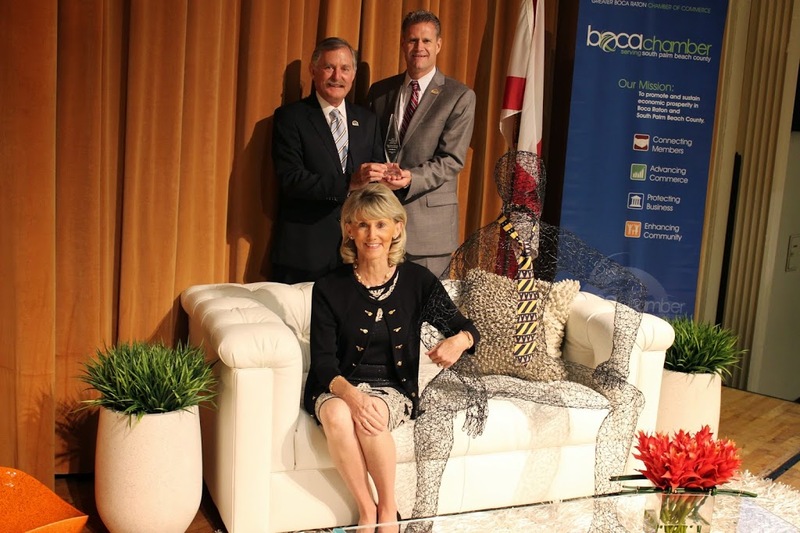 BOCA RATON, FL (June 2, 2014) — Contemporary furniture industry leaders Rick & Pat Howard, co-founders and co-owners of Sklar Furnishings, were presented the coveted 2014 “Small Business Leaders of the Year” Award by the Boca Raton Chamber of Commerce at the organization’s annual awards luncheon at the Boca Raton Resort & Club with more than 500 business, civic, and community stakeholders in attendance. The Howards were applauded for their year ‘round efforts to help drive the message of building a greater eco-community as industry leaders in green advocacy who seek and forge furniture alliances around the globe with designers and manufacturers that share its strong commitment to the environment. As members of the Sustainable Furnishings Council, the Howards said they take great pride in collaborating with a variety of custom furniture lines that are invested, as they are, in heavily reducing the environmental impact of its operations and use of reclaimed natural materials. Going beyond the obvious best practices, Sklar Furnishings partners in creating forests via the National Forest Initiative by donating a tree to one of Florida’s four natural forests for each purchase of a wood product. Rick Howard serves as president of the North American Home Furnishings Association that champions the independent home furnishings retailer — the nation’s largest organization devoted specifically to the needs and interests of home furnishings retailers, with more than 1,800 members representing more than 7,000 storefronts across all 50 states and several foreign countries. Since Sklar Furnishings opened its doors by the entrepreneurial husband and wife team in November 2002, the company has had a long, strong community presence and engagement, including a partnership with Habitat for Humanity that provides “simple, decent, and affordable” housing for low-income families. Sklar donates thousands of dollars in merchandise to the organization that in turn is sold in ReStores, thus being recognized as a recipient of the “I Gave at the House” Award for six consecutive years. With Rick Howard serving on the Habitat for Humanity board of directors, Sklar’s support escalated to underwriting the construction of its first Habitat For Humanity home that was completed and dedicated in October 2013. Other nonprofits supported include Florence Fuller Child Development Centers, Junior League of Boca Raton and Rotary International. Open seven days a week with showroom hours: Monday-Saturday, 10 a.m. to 6 p.m.; Sundays 12 Noon to 6 p.m., Sklar Furnishings is located at 6300 North Federal Highway, Boca Raton, FL 33487. For more information on its furniture and accessory lines, call (561) 862-0800.